I saw this recipe on my favorite cooking gurus’s YouTube channel, “Sam the Cooking Guy”. But it was loaded with butter, oil, and beef broth. Well….. since I am Chuck the I Gotta Make This Healthier Guy…I knew I’d have to make a few changes if I wanted to try it. And with that – I give you my version of Vegan Red Onion Gravy. And it’s pretty darn good too. A lot of people have asked me how I come up with my recipes. Well here is one example. If I see something that looks good, whether it’s Vegan or not, I’ll play with it and try to make it healthier. So seeing how I love gravy, I knew I was going to have to try this. So thanks to Sam the Cooking Guy for the inspiration to veganize this recipe. You can watch his video here…. Replacing the butter and oil was easy, because we can easily sauté (and yes, even caramelize) vegetables without it. And when you leave all that fat out of the equation, what you’re left with is just pure veggie goodness, as the REAL flavor of those sweetened Red Onions come through. Yum! Next was the beef broth which can easily be subbed with a good Veggie Stock. And the rest, as they say, is history. Now I know someone is going to ask if they can sub out the red wine for something else…..you can most certainly try, but in this particular recipe the red wine imparts such a distinct flavor to the overall gravy….it simply will not be the same. 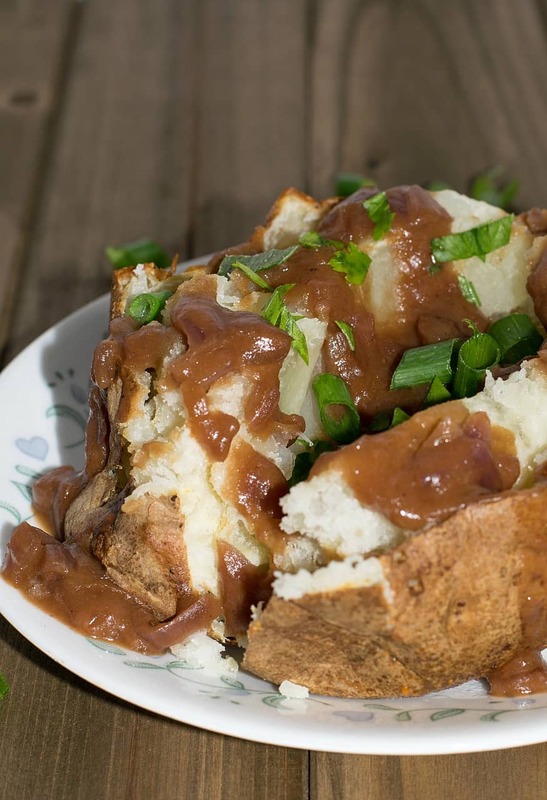 With the holidays just around the corner, I can easily see this on the dinner table, ladled onto piping hot baked potatoes, or even a lentil meatloaf. Om my gosh, please pass the Potato Rolls! I hope you like this one….I know I sure did. Let’s go make some gravy! Start with 2 large Red Onions. Cut off the ends and peel off that tough outer skin, and dice them to whatever size you want. I diced mine pretty small, but you make like longer strips of onion in your gravy….your choice. Start heating up a large skillet and dump in your onions. They will start to sizzle and soften all by themselves, so none of that butter or oil is needed. The secret to caramelizing onions without oil, is to just be patient. It will take a good 30 minutes or longer before they’re ready – but don’t go anywhere – occasionally you’ll want to stir them up a bit so they don’t burn. They WILL stick some, that’s expected. But all those browned bits stuck to the pan are full of flavor, and we’ll deglaze the pan later so no worries. When the onions have significantly reduced in size, and have turned a golden brown in places, and are basically becoming a big pile of mush…… go ahead and pour in a bit of veggie broth….just to loosen up this browned bits I mentioned earlier. Now sprinkle on 2 tablespoons of flour and mix well. Keep stirring and mixing that flour into the onions for a good minute or two and then we’re going to add 1 cup of Red Wine, and 1 cup of Low Sodium Veg Broth. Turn up the heat to med-high and give that a good stir. Be sure and scrape up anything that was stuck to the bottom of the pan. Add 2 tablespoons of Low Sodium Soy Sauce, and 1 tablespoon of Dijon Mustard, plus 1-2 more teaspoons. I used 2 full tablespoons and I think it was a bit much…. That’s it. Salt and Pepper to taste and keep stirring until it thickens. Simmer until it gets to the consistency you like and serve. 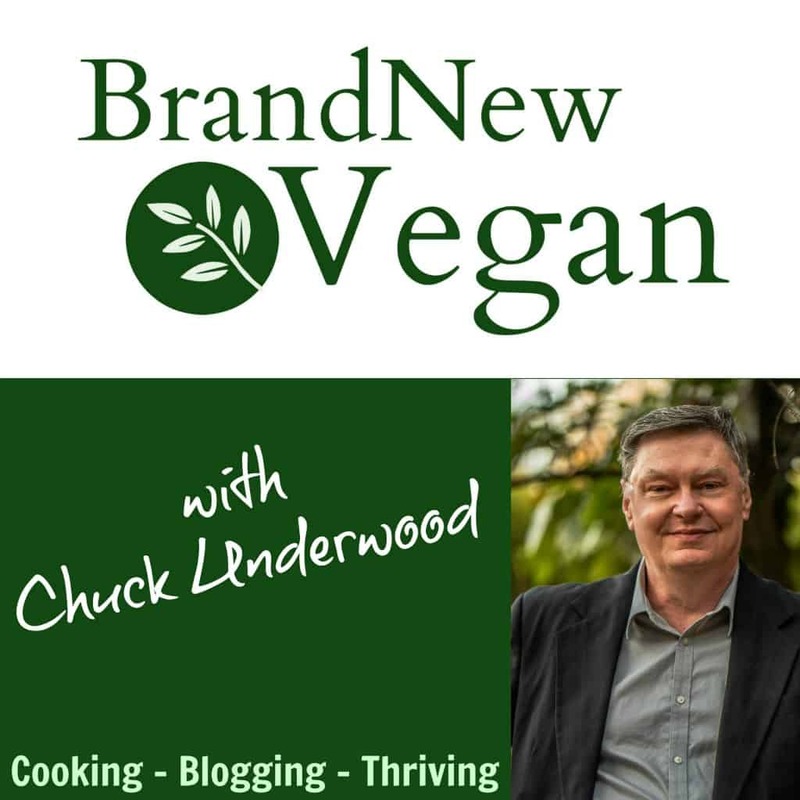 Love the photos on Instagram….copy me by putting in the hashtag #brandnewvegan. Love all the comments on Facebook too so keep them coming. I got another Holiday Recipe planned for this weekend, so we’ll see you then. 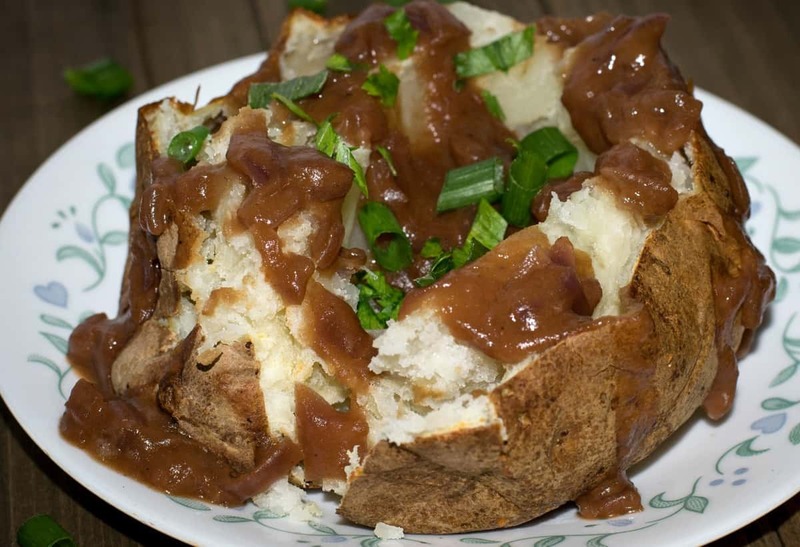 This Vegan Red Onion Gravy will surely be the hit of the party. 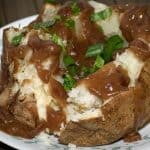 A rich, flavorful gravy perfect for ladling over fluffy baked potatoes, or that Holiday Lentil Loaf. Dice Onions and add to a heated skillet. Saute over medium heat for about 30 minutes, until Onions have reduced in size and have begun to stick to the pan. They should be somewhat browned by now. Add up to 1/4 cup of Veg Broth to loosen onions from pan, scraping up any browned bits off the bottom as you stir. Sprinkle 2 Tbs Flour over gravy and mix well. Allow to simmer for 1-2 minutes while constantly stirring. Add Veg Broth and Red Wine. Increase heat to med-high and stir to mix well. Add Soy Sauce and Dijon and stir to incorporate. Continue stirring until gravy thickens. Reduce heat and simmer to desired consistency. Original Recipe Date: November 15, 2017. Tips are always welcome and appreciated! Just made this recipe. Delicious! This one reminds me of a nice onion soup. I think with more broth and leave out the flour and you have some great onion soup from this one recipe. The wine gives it more flavor depth.